Destiny brought them together, the Gods will keep them apart. Helen Hamilton has spent her entire 16 years trying to hide how different she is--no easy task on an island as small and sheltered as Nantucket. And it's getting harder. Nightmares of a desperate desert journey have Helen waking parched, only to find her sheets damaged by dirt and dust. I'm loving the Greek mythology stories that are big right now and Starcrossed is an imaginative and fresh story based in that mythology. The feuding families of gods and demi-gods who are trying to find Atlantis provide a rich well for Angelini to create her story. The story has a great sense of place in Nantucket. I felt transported to the ocean and the idiosyncrasies of it's small towns. I love it when an author takes me away for a little while. Helen and Lucas' forbidden love didn't work for me. I couldn't relate. I wanted to feel the spark caused when two people can't stand to be together and yet can't stay away, but I couldn't get into it. I knew they would end up together and it slowed the pacing for me. Later in the story when it was known that they could never fully express their love to each other, I cringed at the resulting scenarios. Helen and Lucas alternate between pushing the boundaries and claiming that they could remain celibate. 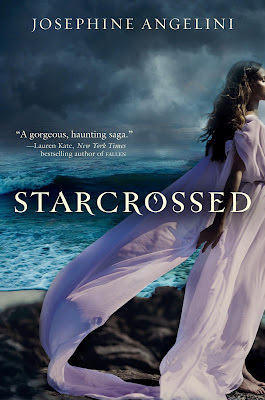 There is tons of action in Starcrossed and I didn't want to put the book down. I never knew who would be spared and who was in serious jeopardy. Unlike some paranormal stories where the protagonist finds out later in life that all along they had these amazing powers, Helen's story is entirely plausible. I could believe that she didn't know about her God-like powers because of the curse that had been placed on her and the fact that she suppressed her own memories about her powers. I love it that her best friends knew that she was extraordinary and she didn't even have a clue. And cool powers--invincibility (but also vulnerable if she lost her necklace), and a lethal lighting charge. It would be way cool to see her abuse her new-found powers a bit and be tempted by the "bad side" of the family. I'm not sure what to think about the sirens. They are wicked in an awesome, gruesome way, and I would like to have seen Helen and Lucas go after them. Starcrossed crosses the line between myth and reality as it asks what in life can be controlled and what is left to fate? PitchDark Presents the Dark Days of Supernatural Paranormal Romance Sampler is where I first read a teaser of Starcrossed. Since it's my birthday in a couple of days, I figured why not go for it. What I read so far left me wanting more. This book is just up my alley as far as reading for pleasure. Of course, so are a few other genres. I am just so impressed. Thank you so much for writing this book!